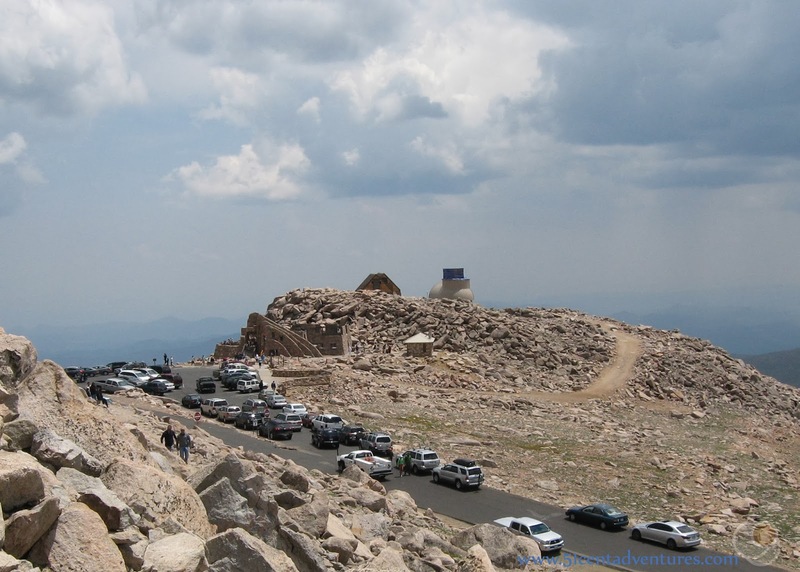 Most people assume that Pike's Peak is the only mountain in Colorado that you can drive to the summit. However, Mount Evans is another option. 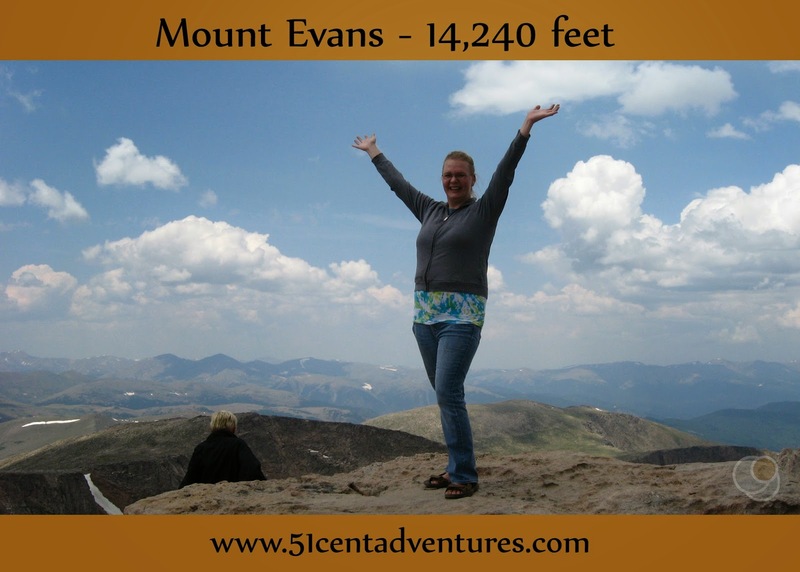 Mount Evans is actually a better option because it is cheaper and about 200 feet higher than Pikes Peak. Cost: $10.00 for a three day pass. Free with a National Parks Pass. Operating Seasons and Hours: The top 5 miles of the road are open from the Friday of Memorial Day Weekend until Labor Day. The lower section of the road will stay open until the first weekend of October. This is all weather permitting. Recommendation: A great way to stand on top of a mountain without hiking all the way up there. Before I had kids I had a job with an hour long lunch break. I got into the habit of eating lunch and reading a book outside my office building. I read many books on many different subjects during those lunch breaks. One of my favorites was Halfway to Heaven: My White-knuckled--and Knuckleheaded--Quest for the Rocky Mountain High by Mark Obmascik. The book was about a middle aged man's goal to climb all the mountains in Colorado that were over 14,000 feet high - the 14ers. As I read the book I realized that I'd never actually stood on top of a mountain. I'd hiked mountains before, but for various reasons had never stood at the top. I'd also gone on many hikes, but they never resulted in standing on the highest place for miles around. When I finished the book I made a little resolution to one day stand on top of a mountain. About three years later, Brandon and I were planning our annual anniversary road trip. We decided to go to Colorado to visit my sister and her family. As I was researching things to do on our trip I remembered my desire to stand on top of a mountain. Hiking in any form was out of the question for that year though. My twins weren't even two years old yet and my baby boy would be barely three months old on the trip. Driving to the top of a mountain; however, was do-able. Somehow I knew that we could drive up to the top of Pikes Peak so I put that onto our schedule of things to do. But two weeks before our vacation started I read a blog post written by some friends who lived in Colorado. 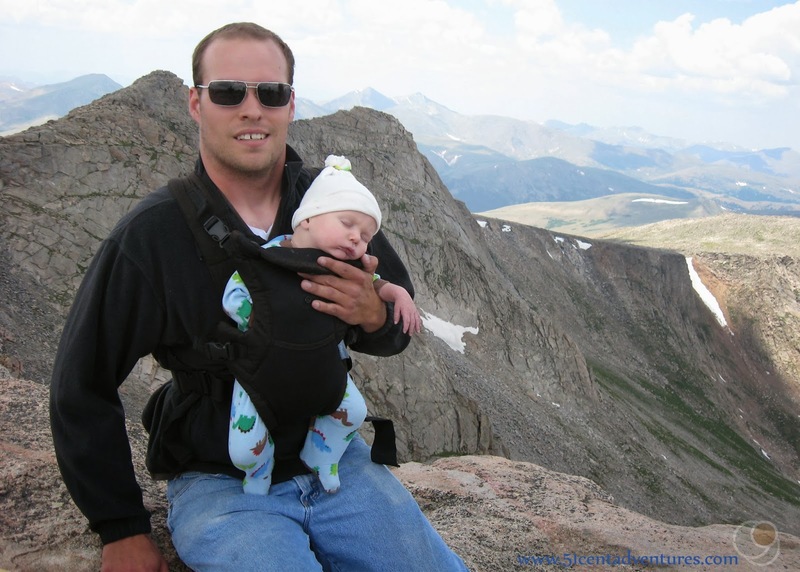 They wrote about how they were turned away from driving Pike's Peak because their baby girl was only three months old. The toll gate worker told them, "her lungs will collapse at such a high altitude and she will die." This was an untrue theory because my friends had climbed another 14,000 foot mountain with the baby in a backpack literally the day before. She did not die on that hike. Since our car would have our own three month old, I didn't want to risk getting turned away at the gate too. I e-mailed my friends to see if they knew how old a baby had to be before they would be allowed up Pike's Peak. My son was big for his age, and I wasn't above lying if it would get me to the top of a mountain. Fortunately for my ethics, my friends told me about an alternative mountain that we could drive up - Mount Evans. 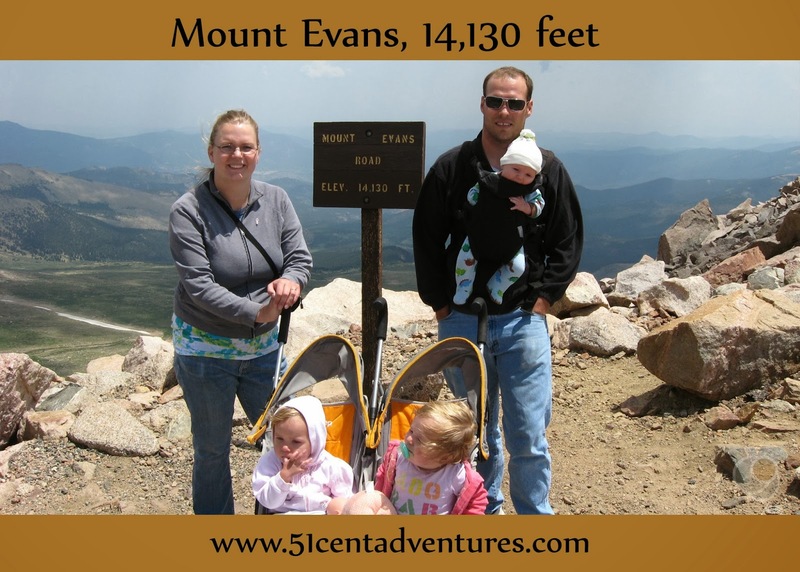 Aside from allowing us up the mountain with a baby in the car, Mount Evans had two distinct advantages over Pike's Peak. One, it was higher by about 200 feet. And two, it was much cheaper. I'll spare you the pricing details, but basically Pikes Peak would have been $10 per adult. Mount Evans, on the other hand, was only $10 per car. 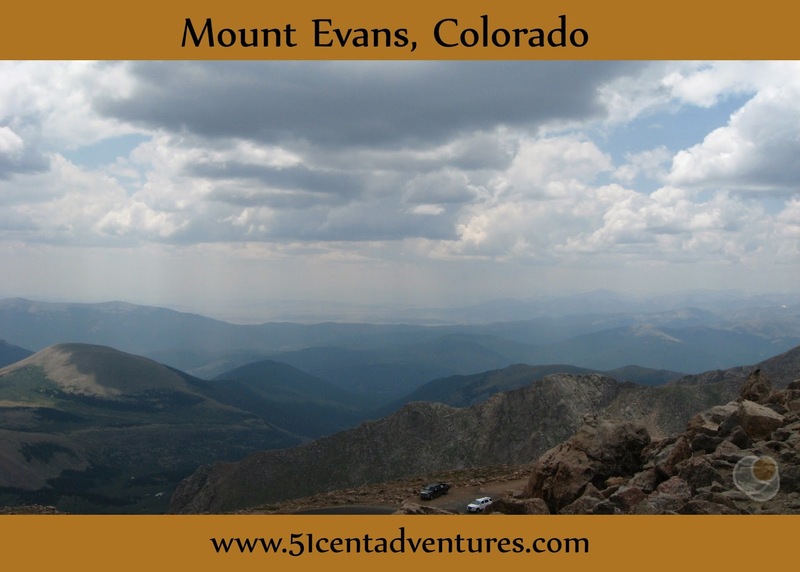 The price alone was enough to put Mount Evans on the schedule instead of Pikes Peak. 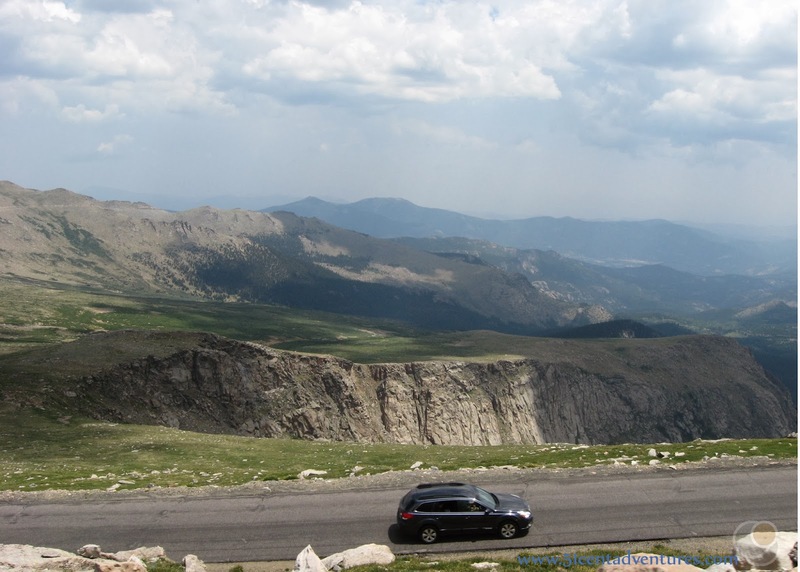 We drove up Mount Evans around noon on the day after the Fourth of July. There were many wildfires burning throughout the state that summer, and the air was full of smoke. The road from Idaho Springs to Mount Evans was 28 miles long. The first 14 miles were like any other canyon. Once we passed the official entrance station we began to drive up the mountain. We gradually went higher and higher. After 9 miles we had to start navigating switchbacks. The last 5 miles of road were all switchbacks. There were some pretty steep drop-offs on the side of the road. I do not recommend this drive to anyone who is afraid of heights. 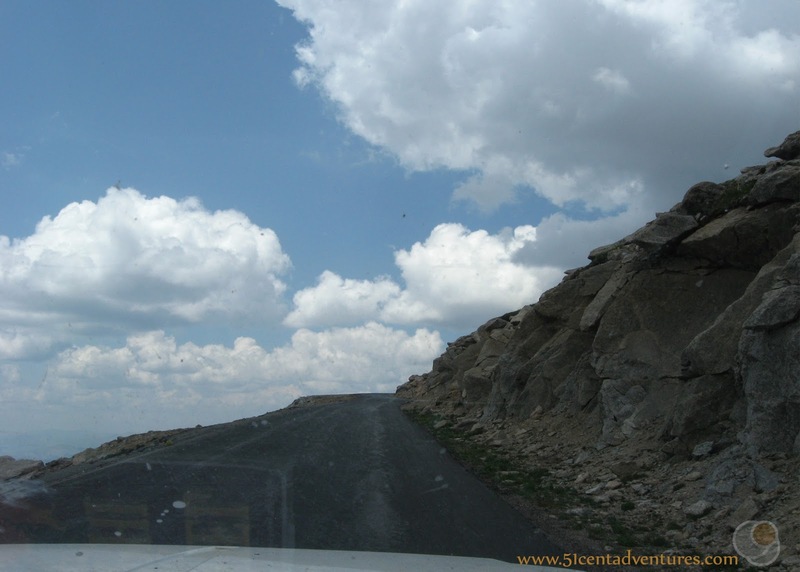 Mount Evans is called the road into the sky, and that is certainly what it felt like. We could feel the air get thinner as we drove. We both became a little light headed. Brandon said he was a little sleepy. Our throats started to hurt as well. Eventually we rounded the last switchback and arrived at the parking lot. There are three things accessible from the parking lot. The dirt road that leads to the the University of Denver Observatory. It's not open to the general public though. The Crest House. From 1931 to 1979 the Crest House was the highest structure in the world. In 1979 there was a propane tank explosion that destroyed all but a few walls of the building. In 1992 the remains were stabilized and reshaped into a lookout platform. There are stairs and a ramp that lead up to the lookout. 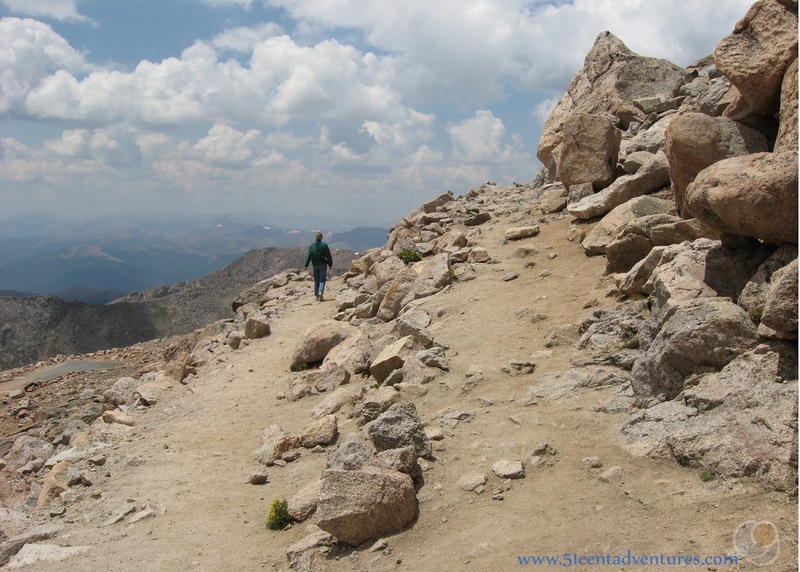 The trail to the summit of Mount Evans. It switchbacks up another 110 feet to the actual summit. We got the kids out of the car and started to explore. It was very windy and a little cold. It even rained a little bit. I'm glad we all had jackets. There was a sign that marked the elevation of the parking lot at 14,130 feet above sea level. We made sure to get a family picture with this sign. We were pretty excited about the fact that we were all able to be so far above sea level. The trail to the top was rugged. There was no way our stroller could make the climb. There was also no way our toddlers could make the climb on their own. So I took the twins with me to explore the Crest House while Brandon hurried up to the top of the mountain. Our baby went along for the ride. For the record, his lungs did not collapse. 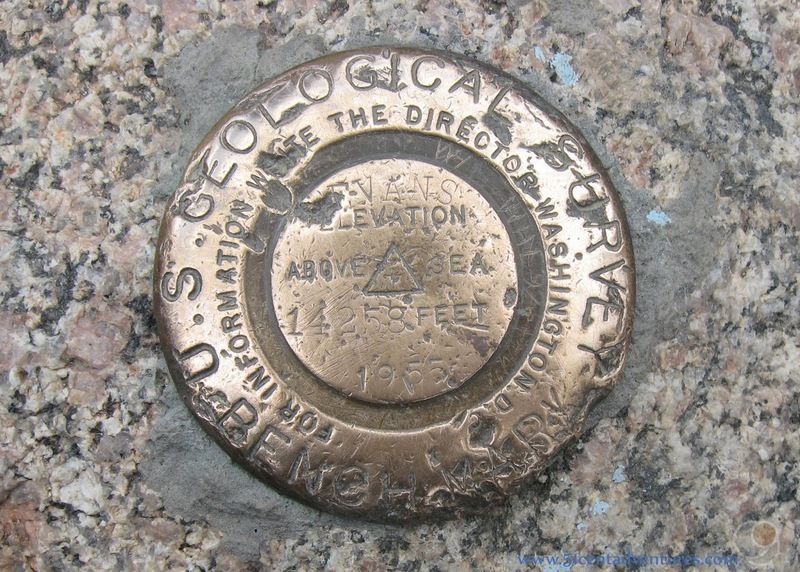 According the the US Geological Survey marker, the Summit of Mount Evans is 14,240 feet above sea level. Brandon came down from the summit, and we put the kids into the car, Then I walked up to the top. I was finally able to accomplish my goal of standing on top of a mountain. It felt great to look around at the 360 degree view and not see anything taller than me. Now I have a new goal to someday hike all the way up to the top of a mountain. Directions: Mount Evans is accessible from Idaho Springs, Colorado which is located on I-70 about 60 miles west of downtown Denver. Idaho Springs is located about 20 miles up the canyon. Take exit #240 "the Mt Evans Exit," and turn onto State 103. 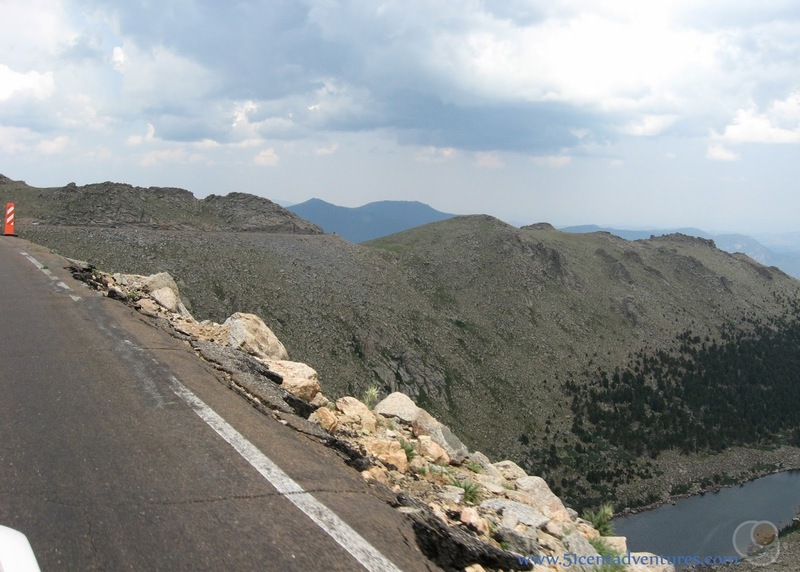 Drive south on State 103 for 14 miles until you reach the Mount Evans Entrance. This is where you will pay the entrance fee. Then you drive another 14 miles to reach the top. 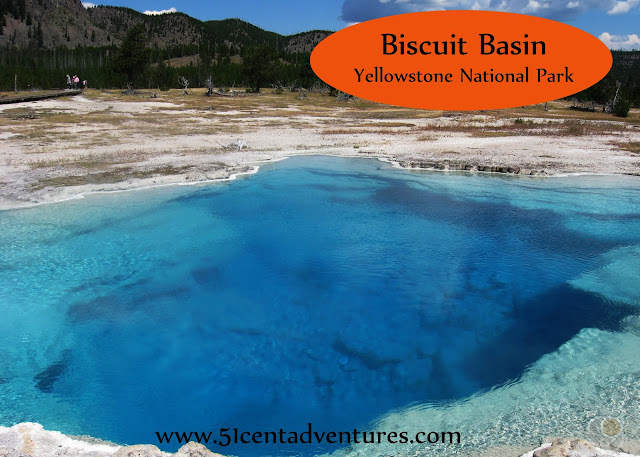 There are several picnic sites and interpretive places to visit along the way. Additional Information: Another book by Mark Obmascik that I enjoyed reading was The Big Year: A Tale of Man, Nature, and Fowl Obsession . This book is about the sport of birding. It also makes you think about what you would do if you had a whole year to focus on doing one thing that you love. I saw a commercial on TV that reminded me of your blog. I think it was for Traveler's Insurance and it has everything rewinding. A dandylion's seeds are blown back onto its stem, runners run backwards etc. And the commercial says, "Happy vacations begin with good planning" That sums up the purpose of this blog. Thanks for the article.